As my retirement was approaching, I began to think about the best way to spend it. 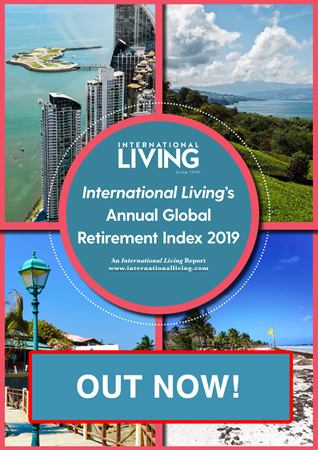 I was working as executive director of a substance abuse counseling agency in Hartford, Connecticut and as it came to an end, I realized that I wouldn’t be able to afford the same quality of life in retirement. So I began looking at the option of living overseas. I had made several trips to Costa Rica and then a friend suggested I check out Ecuador. My first trip, five years ago, took me to Quito and surrounding towns of Otavalo and Cotacachi, then to Banos Ambato and Puyo, and finally to Cuenca. 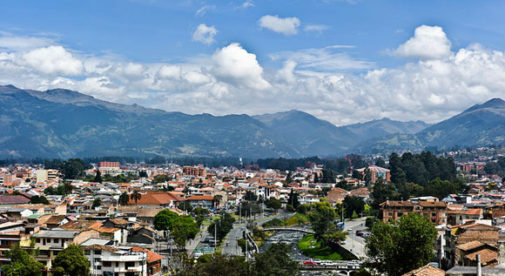 I can honestly say that I had not heard of Cuenca before I started researching my trip…and it was love at first sight. Cuenca is absolutely beautiful. The architecture is amazing, with the iconic domed New Cathedral serving as the centerpiece. The colors of Ecuador, best seen in the weaving and art work available all over the city, most notably at Plaza San Francisco, and the flower market across the street from the cathedral, are spectacular. The cost of living was a major consideration in my decision to move to Cuenca. I have a three-bedroom apartment with a small terrace and spectacular views of the city that I pay under $400 a month for. Most of my food is purchased at the mercados. I can buy a bag full of fruits and vegetables for under $10. A pound of beautiful big strawberries costs $1. My “regular lady” always waves me over when she sees me, and puts a little something extra in my bag…maybe an avocado or a couple of peaches. 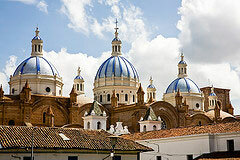 If you love beautiful architecture, a mild climate, and friendly locals, Cuenca, Ecuador could be for you. Most of my lunches or “almuerzos” are eaten at restaurants in the center of town. For $3, I get lunch that includes a bowl of soup, and either pork, chicken, or beef served with rice and vegetables, a glass of juice, and a small dessert. I like to cook so dinner is usually at home, but at least once a week I dine out with friends. Great meals can be had for less than $20 per person at really fine restaurants all over the city. The weather in Cuenca is perfect for me, too. I don’t like hot weather unless I am at the coast for a vacation from my “permanent vacation” here in the highlands. The winter months of July and August are cool, but compared to the harsh winters in Connecticut, the climate here is just fine. We get occasional heavy rains, but for me that’s a plus, as we often get some amazing rainbows and sunsets afterwards. Cuencanos are, without a doubt, the nicest and kindest people I have ever met. On my first visit I met a Cuencano family who invited me to join them on a day trip. We are still very close and I have been a guest at their home on Christmas Eve the last few years. And I’ve made many friends here who often stop by (with the whole family) for an afternoon on the weekend. The decision to move to another country, and another continent, is one that I have never regretted. Life here really is great.